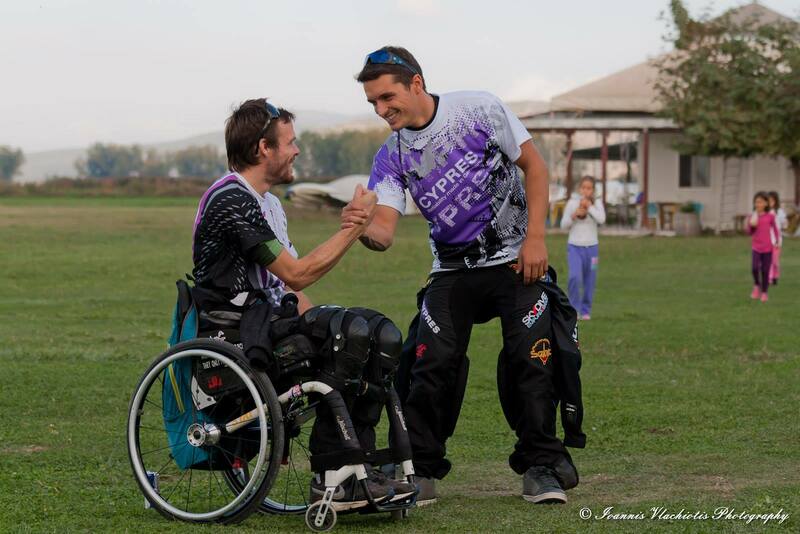 When we talk to CYPRES athlete Alex Feretos, he’s just celebrated his birthday weekend. Clearly, Alex has more than most to celebrate. This hard-charging multi-sport adaptive athlete has been turning heads for the past couple of years, and things are really starting to heat up for him. When he blew out the candles on his cake this year, he was also celebrating being the lowest-jump-number sponsored skydiver on the CYPRES team, a distinction he has earned in spades. 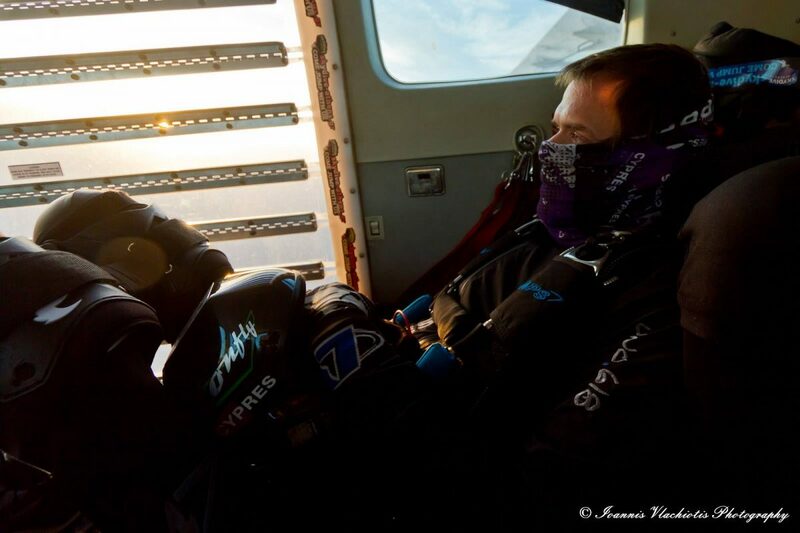 To be honest, the fact that he’s a skydiving athlete now has come as something as a surprise to Alex. He always figured he’d be known for motorcycling, a sport he pursued as far back into his childhood as he can remember. Born to a German mother and Greek father, Alex spent his first nine years in Germany before the family moved to Greece. Over the years, Alex made the classic level-up from little dirt bikes to road bikes and then, finally, racing machines. He studied abroad for three years in Brighton, England, then wrapped up his studies, served his term in the Greek army and settled into a comfortable pattern of working and adventuring on his collection of motorcycles. In 2009, when he was 26, he was on his beloved Kawasaki 636 Ninja something terrible happened. He still doesn’t know quite what. Alex describes the next phase of his life as, simply, “tough.” He isn’t, however, the kind to give up. As a first step, he started playing wheelchair basketball. He lives close to the sea, so he took up open-water swimming. He tried kitesurfing. Alex is too humble to describe himself as such, but it’s pretty clear in talking to him that he’s totally unstoppable. In 2012, he put that go-and-figure-it-out mentality to work. 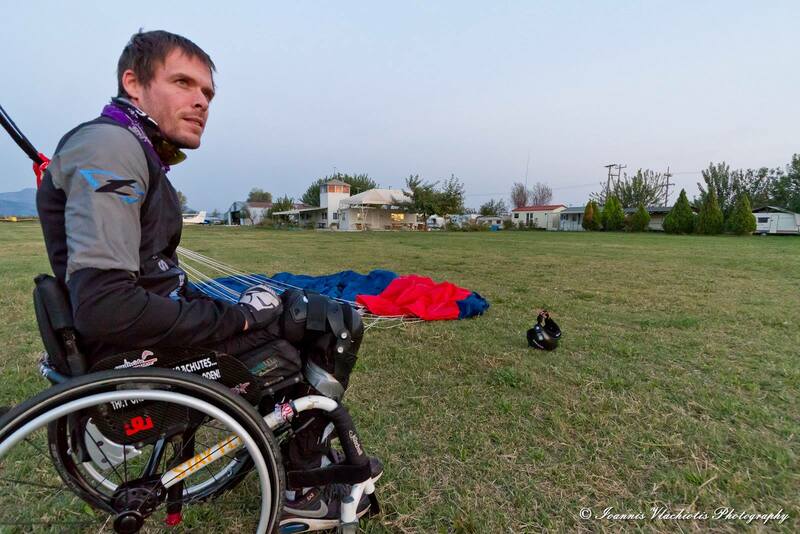 He decided that, despite the odds, he wanted to have a long-daydreamed go at skydiving. 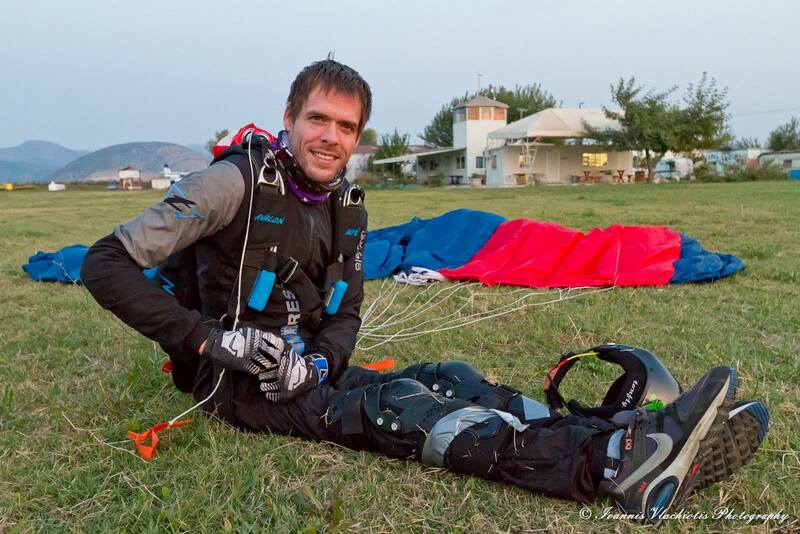 To satisfy his curiosity, Alex went out to Skydive Athens in his native Greece for a tandem. He fell instantly in love. It took Alex four years to raise a positive response. 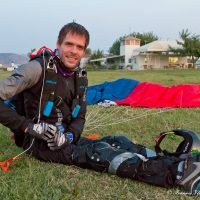 In 2015, Alex did his first AFF jump at Southside Base in Germany, between Frankfurt and Stuttgart, with Andy Boss and Rob Huron. 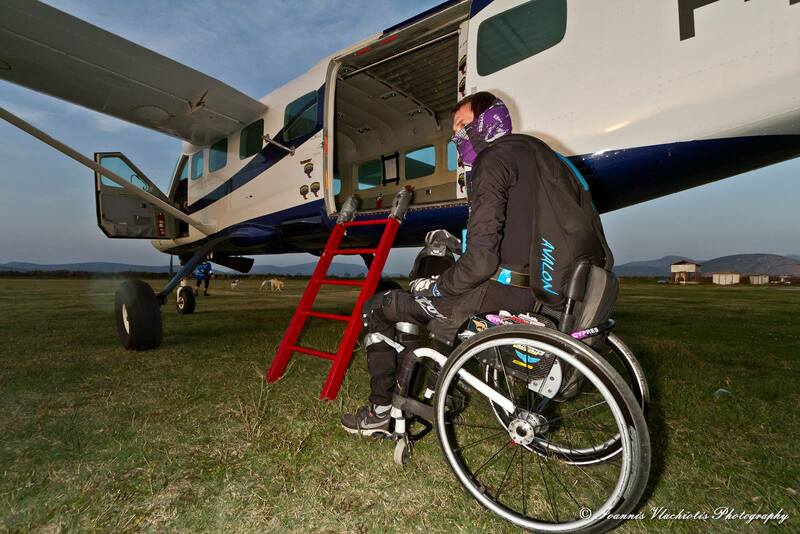 “They had some experience [with adaptive skydiving] and a clear picture of how it would work,” Alex explains. Chasing the dream, he sold his car and left for Germany with a suitcase. He stayed there for three months to finish AFF and start jumping in earnest. Nailing the slippery beast of stability is hard enough when you can use your legs to help; when you can’t, it’s quite the uphill battle. “If you fly your upper body the right way, it translates to the lower limbs as well,” he says, “And your legs just follow. That takes some time to learn. But then, of course, there’s the landing part. You have to do the flare exactly right in order not to hit the ground really hard.” Now that he has the knack of it, 300-something jumps in, Alex describes his landings as “butter soft”–but that has taken quite a bit of work. 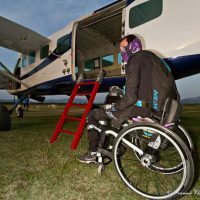 To skydive, Alex–whose injuries have left him with no ability to move his legs–has co-innovated a unique equipment setup. He uses a Y link on his rig and two braces for his knees. Those braces have two functions: to protect him from the impact of landing and to keep Alex’s legs parallel to each other in freefall. 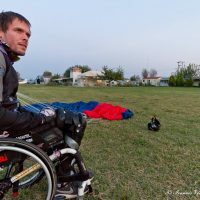 These days, Alex is bringing that setup out to his home dropzone of Skydive Athens pretty much every weekend. He loves it. 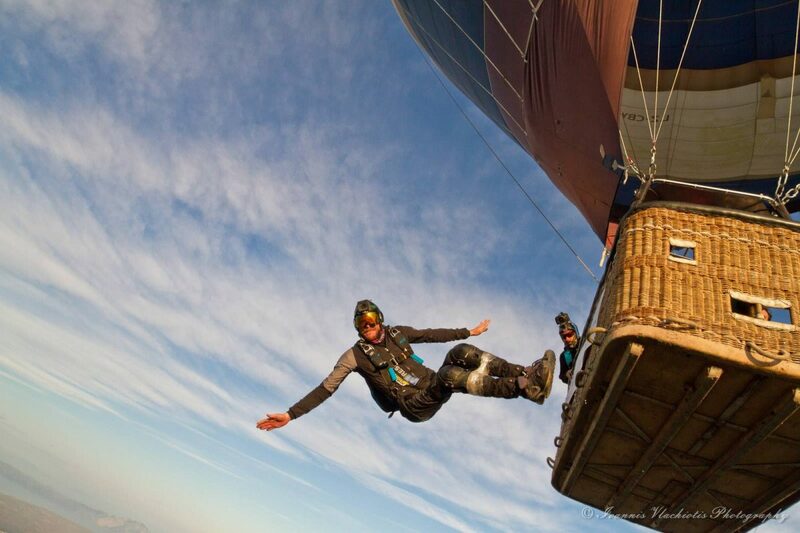 Alex is putting all that year-round skydiving to great use. With that attitude, he could focus on any sport he wanted to. When you ask him why, of all the sports he’s dabbled in, he’s so dead-set on skydiving, he has a ready answer. 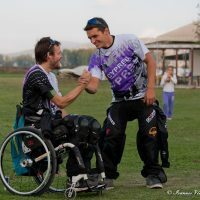 As well as jumping proudly for CYPRES, Alex is making lots of other adventurous plans to inspire other athletes–adaptive and not. This winter, for instance, he’s traveling to Germany to have a go at bobsledding with rockstar adaptive athlete Lonnie Bissonette. Clearly, he’s taking the same advice he says he’d give himself if he could be there to watch himself wake up after that life-changing accident.